It’s hard to take the screenshots on friday, cause if I take too early or too late, it differs 50-60k gold, since friday and the weekend in general, is the best AH days. This week I took at the same time of the day as last week to get accurate results. I almost managed to keep Chest – Mighty Stats and Boots – Earthen Vitality in stock this week, but its room for improvement as always. Eternal Air, Earth, Shadow and Fire are results of buying Frozen Orb cheap. I love it 🙂 Buying Orbs at 10 gold each made me ~1500 gold pure profit this week. I love my Mechano-Hogs more and more. 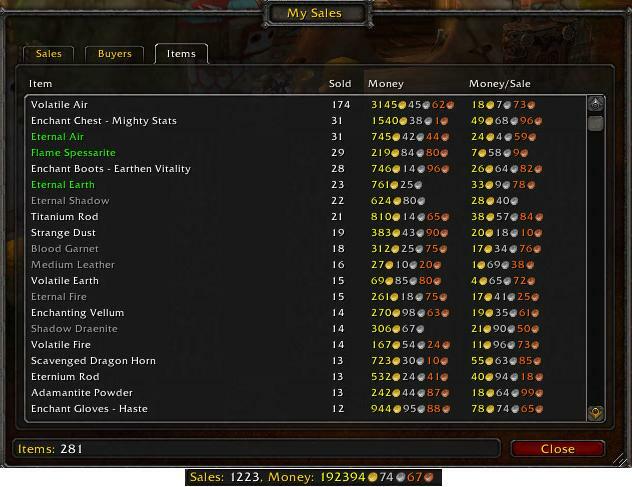 22500 gold pure profit this week from those alone. 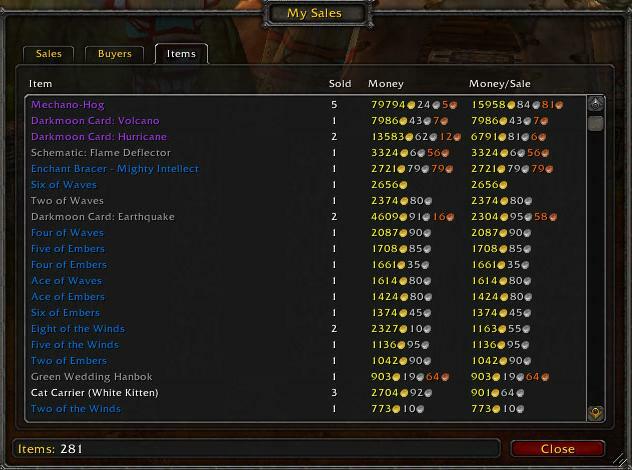 Darkmoon Cards.. As you can see I sold some the first day of the faire, but the following days were not a good time to sell, so I currently got ~400 000 gold worth of trinkets I will sell when the faire leaves town and the prices rise again. I invested maybe 150 000 – 200 000 gold in herbs / single cards / cheap decks this week, I hope I at least get that back. I can potentially double that, but with trinket prices falling for every faire since Cataclysm was released, it’s a bit risky. 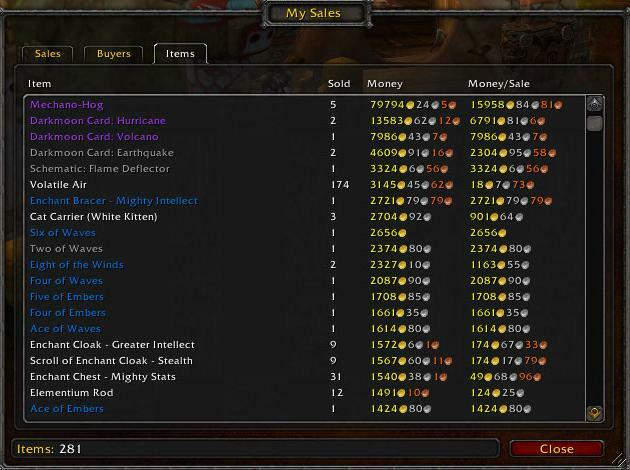 I have been buying / selling some single cards aswell during the faire. Buying out low-priced, selling eighter overpriced or normal. There is not much competition in the Elementium Rod department, it’s actually more competition on the lower level Rods. With good reason perhaps, since Titanium and Eternium Rods sell better, but its a bigger profit margin on the Elementium Rods, at least on my realm, so don’t forget about them. Be sure to check out all my MySales Weekly Statistics-posts. This is the 10th week I’m posting my sales for you to check out. Remember, time is money! So if you see me in-game, throw me a dollah. I will be the goblin pimp in the blue dinner suit. Be safe.